[fusion_builder_container hundred_percent="no" equal_height_columns="no" hide_on_mobile="small-visibility,medium-visibility,large-visibility" background_position="center center" background_repeat="no-repeat" fade="no" background_parallax="none" enable_mobile="no" parallax_speed="0.3" video_aspect_ratio="16:9" video_loop="yes" video_mute="yes" overlay_opacity="0.5" border_style="solid" padding_top="20px" padding_bottom="20px"][fusion_builder_row][fusion_builder_column type="1_1" layout="1_1" spacing="" center_content="no" hover_type="none" link="" min_height="" hide_on_mobile="small-visibility,medium-visibility,large-visibility" class="" id="" background_color="" background_image="" background_position="left top" background_repeat="no-repeat" border_size="0" border_color="" border_style="solid" border_position="all" padding="" dimension_margin="" animation_type="" animation_direction="left" animation_speed="0.3" animation_offset="" last="no"][fusion_text] Planning an epic backpacking or camping trip soon? It's essential to pack the right gear to have the best possible trip, as we have learned during our many outdoor adventures. In this post, we will share our essential backpacking and camping packing list with our recommendations on specific gear that's helped us out on our previous trips. This is the packing list that we've used to equip ourselves for a week-long backpacking trip to Glacier National Park, and most recently, a weekend backpacking trip to Eightmile Lake in Washington State. If you have other ideas, we’d love to hear them. Please share your backpacking and camping packing list advice in the comments below! Scroll down for a free packing list to download. The exact type of camping gear you need will vary according to your preferences, as well as the weather you will be camping in. Here in the Pacific Northwest, we plan for carrying our own backpacks and having gear suitable for somewhat cold, yet not snowy cold, conditions. Below are some of our specific favorites. Not all campsites will have running water. This is one of many reasons why it's vital to pack a solid personal hygiene kit to keep you feeling clean. Our personal favorites are shower wipes that act as a quick refresher when you can't take a bath. Also, don't forget the toilet paper! While you can easily get away with camping or backpacking without cooking, you'll enjoy warmth and hearty meals at a relatively low cost if you invest in a camping stove and cookware. We also recommend adding a Life Straw to your hiking or camping packing list. This handy personal filter has proved to be useful while backpacking and also traveling abroad. When it comes to camping food, you have quite a few options these days. You can keep your meals basic by sticking to trail mix and peanut butter jelly sandwiches. Or you can invest in a rather affordable and portable camping stove to make some pretty tasty meals. In particular, we are big fans of Mountain House meals. Just add boiling water and you can have hearty beef stroganoff at your campsite in just a few minutes. Moisture-wicking hiking clothes are essential for an outdoor adventure since they are both lightweight and dry quickly. Solid hiking boots are also a must, and we recommend boots by Salomon. Trekking poles are also very handy, especially if you've got a lot of gear in your backpack. You'll have a decent amount of downtime at your campsite, so entertainment is important. Opt to go tech-free and stick with portable board games or books, or bring your phone pre-loaded with audiobooks and a Bluetooth speaker. Field guides are also fun, educational, and engaging. Did you find this post useful? Pin it for later or share with a friend! 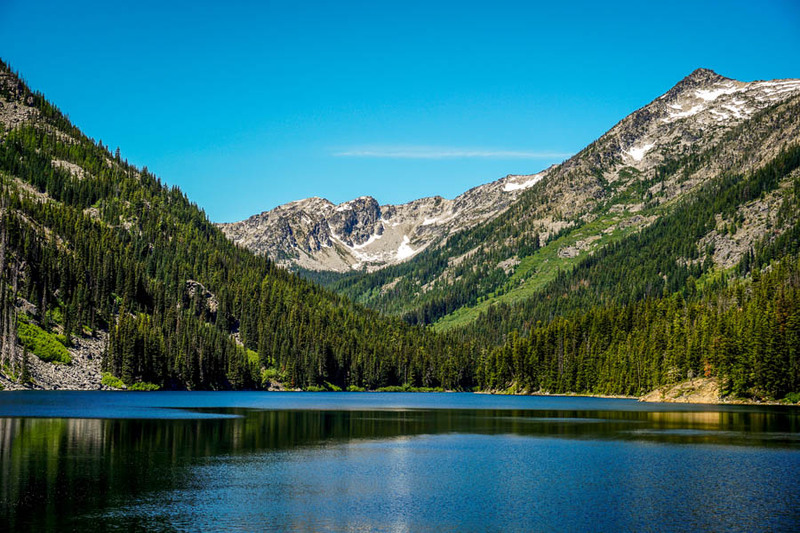 One of the most beautiful and quite accessible hikes in Washington State is Eightmile Lake in the Central Cascades of Leavenworth. This was our destination for our annual 4th of July road trip, in homage to our very first trip in 2012 to Glacier National Park. When most people travel to Seattle for the first time, they spend a day or two in the city before quickly moving on. Very few travelers venture east of Seattle to experience the impressive nature of Washington State. The Central Cascades, in particular, are a hiker and outdoor enthusiast's paradise. There are tons of hiking trails to suit all fitness levels. A popular part of the region is the Enchantments, an impressive yet rugged alpine paradise for hikers and backpackers. While getting into the core Enchantments can be difficult due to the necessary permit and skills, an easy way to access part of the area is through Eightmile Lake. A major part of this region is the fairytale town of Leavenworth, which is modeled after a Bavarian village. 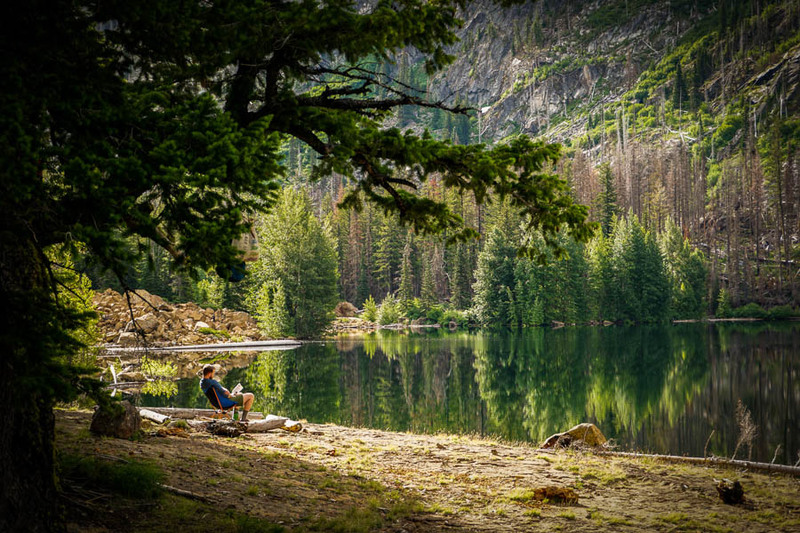 Drive about 15-minutes south of Leavenworth, and you'll arrive at the trailhead of the Eightmile Lake hike, where we begin our adventure. It's important to note that this blog on Eightmile Lake is not about Eightmile Campground. The campground is a separate large site equipped with picnic tables, campfire rings, running water and facilities for up to 70 people and 25 vehicles. More information on Eightmile Campground. Entry pass or fee? Yes; Northwest Forest Pass needed. Overnight camping at the lake is by permit only from June 15-October 15th. Get more information about the permit lottery. Drive from Seattle to Leavenworth. Stop in the village for a famous housemade sausage at Visconti's. Drive to Eightmile Lake trailhead and hike 3.3 miles to the campsite and set up tents for the night. Wake up at our campsite and do a day hike to nearby Lake Caroline. More on this below in the Activities section. Hike back to Eightmile Lake campsite and spend the night. Pack up camping gear and hike back to the Eightmile Lake trailhead. Drive back to Leavenworth for lunch, and then drive back home to Seattle. Since the initial drive to Leavenworth from Seattle takes about 2.5 hours one-way, that is definitely a big part of our adventure. That might seem like a long time to spend in a car, but the drive through impressive mountains is so scenic that you probably won't mind. Also, keep in mind that while there are other ways to reach Leavenworth that don't involve a car, you will need a vehicle to reach most hiking trailheads. One of the best parts of the Eightmile Lake hike is that you don't have to camp or spend the night. The 6.6-mile trail can easily be done as a day hike if you would rather spend the night in a hotel or bed and breakfast in Leavenworth. In fact, this may be your only option if you didn't win the permit lottery. The hike itself is considered moderate. While you gain 1,300 feet of elevation, this happens over the course of 3.3 miles. There's a steep hill at the very beginning, but it levels out considerably after that first climb. 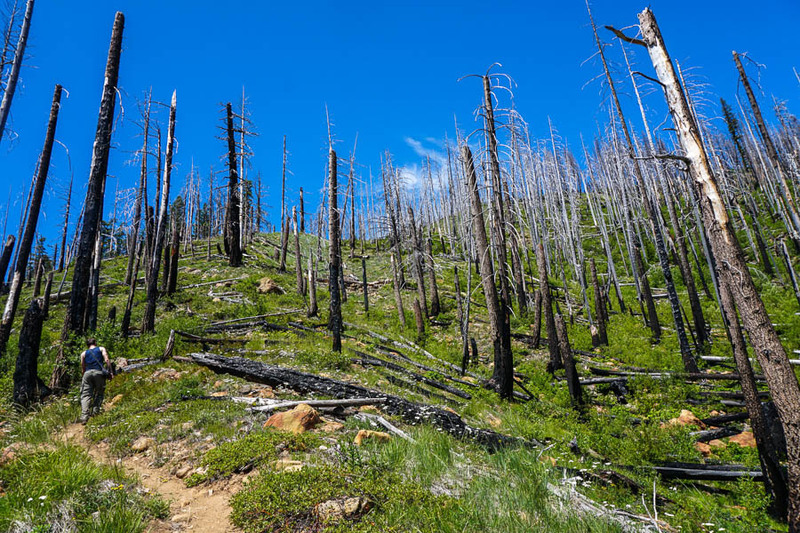 Thanks to the Washington Trails Association, the hiking path is generally very well maintained and it's difficult to get lost. There is a split in the trail within the first mile, so stick to the left on your way in. When you reach the beginning of the Alpine Lakes Wilderness, you'll know it since there is a big wooden sign. Another thing to note is that there are two lakes on this trail. The first one is the marshy Little Eightmile Lake, which you'll reach in 2.8 miles. Enjoy a water break here, but keep going. If you reach another signed junction, stay straight on the main trail, unless you want to detour to Lake Caroline and Windy Pass (do this on the second day). Hike until you reach a small field of boulders. Beyond these boulders is your real destination: Eightmile Lake. As we mentioned earlier, you need a permit to legally camp overnight at Eightmile Lake. Part of the reason for the permit system is because there are a limited amount of camping spots at the lake, as we found out. Since we detoured in Leavenworth and got a late start to our hike, we found that most ideal camp spots had already been claimed by families and large groups. This is where our lightweight camping gear came in handy. We didn't need a ton of space, so we literally squeezed into a small campsite ideally positioned right next to the Eightmile Lake. There are a few things to bear in mind about the Eightmile Lake campsite. First, it is truly rustic, and there is no running water. The bathroom is a literal hole in the ground, so be sure to bring your own toilet paper and hand sanitizer. You also need to bring food and cooking supplies if needed. There are also no trash bins, so you will need to pack up and carry your garbage out with you, so bring a sealable trash bag and some rope to hang it in the trees to keep bears away. Also, bring a portable water filter and water bottle. The water at Eightmile Lake is pretty clean and pure, so we didn't hesitate to drink it after running it through a portable water filter. 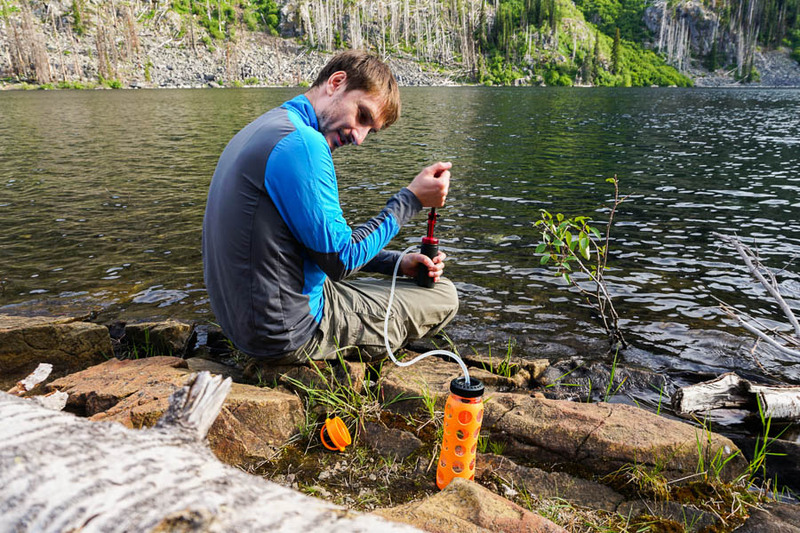 This was our first time testing out the Life Straw personal water filter, and we were pleased with the results as well as its portability. One final note is that campfires are not allowed in Eightmile campsites. While some campers ignore the rule, there are forest rangers that regularly patrol the campsite to check for valid permits and fine violators. But we recommend sticking to the rules. Think of it as being a guest in nature's home. If you're up for a real adventure with stellar eagle-eye views of Eightmile Lake and the surrounding area, you must do the Lake Caroline hike. At 11.5 miles round trip with a 3,100-foot elevation gain, this isn't an easy hike. But you do reach 6,300 feet in elevation, which gives you one-of-a-kind photo opportunities. Lake Caroline itself is a hidden gem, largely because few people are up for the challenge. The lake is set high in a basin between two impressive mountains: Eightmile Mountain (7,996 feet high) and Cashmere Mountain (8,501 feet high). Let's get to the nitty gritty of the hiking trail itself. There are quite a few switchbacks with some steep grades. However, the terrain is stunning and diverse. You'll traipse through paths overgrown brush that will lead to a series of dreamy meadows that look like something straight out of Bambi. Speaking of, it's not unheard of to spot a deer or two, in addition to tons of birds. There is also a grove of recovering trees stained silver from the large forest fire of 1994. All of this terrain is incredibly picturesque, so be sure to bring a camera. The Central Cascades of Washington offer a natural wonderland full of photo opportunities. Whether you're venturing out to Eightmile Lake for a day hike or overnight camping trip, you'll find your peace with nature. Have you hiked or camped at Eightmile Lake? Share your photos, stories, and tips in the comments below!